Zurich Instruments is releasing the first lock-in amplifier with an integrated data and web server. The advantage of this approach is that the instrument can be controlled easily by any web browser without requiring installation of additional software - just plug the cable into the PC and start the system. Integration into a local network is also very straightforward. The signal bandwidth of the basic version of the MFLI lock-in amplifier is 500 kHz and this can be extended up to 5 MHz. Unmatched is the low frequency input noise of around 3 nV/√Hz. With these specifications even the smallest signals can be captured very quickly making the MFLI, for example, ideal for optical experiments with a mechanical chopper or a pulsed laser system. The instrument comes with our LabOne® software, with its outstanding toolset: lock-in amplifier; sweeper/frequency analyzer; signal generator; oscilloscope; spectroscope; FFT spectrum analyzer. The included APIs for LabView, Matlab, Python and C/C++ offer unique flexibility and usability, allowing instrument control and recording of data from one or more computers running your own programs. 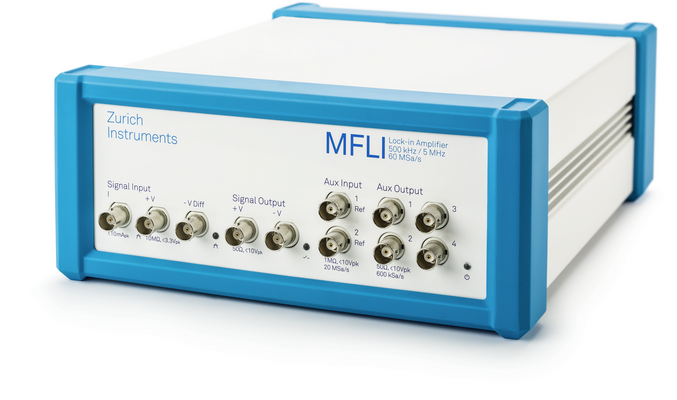 With its small and robust casing, the MFLI lock-in amplifier is designed for a broad range of applications and addresses all researchers and developers who are looking for a powerful and cost effective measurement solution.